Mark Brinkley (aka House 2.0): Why is there so little selfbuild in the UK? Why is there so little selfbuild in the UK? The Coalition government has been the first one to get interested in selfbuild. Grant Shapps, its first housing minister, is a fan and he set in motion an action plan to double the amount of selfbuild in the UK. 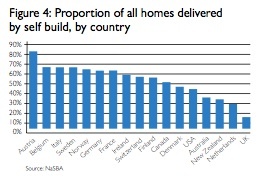 Inside the published report is a tell-tale bar chart (seen here) which shows the level of selfbuild activity across the developed world and, surprise, surprise, the UK is bottom of the list by some margin. For most countries between a third and two thirds of their new housing stock is selfbuilt; in Britain, it's between 10 and 15%. Rarely can a bar chart have been so significant in shaping policy. One glance at it tells you something very straightforward: what goes on in the UK housing market is not normal. But just why we have developed a different housing market? There are a couple of other cogent statistics which tell us more of the same story. Our new homes are smaller than elsewhere. And we build fewer of them. By way of comparison, in 2012 the UK will build around 100,000 new home whilst in Germany, a country with a population 30% larger and with lower levels of immigration, the figure will be around 220,000, or 60% more per head. Of which, according to our chart, 60% were selfbuilds. So there are more new selfbuilds in Germany each year than we manage to build in our entirety. I can believe it. You don't need to go to Germany to see how homes are built. Just visit Google Earth and hone in on the suburbs of any town or city in Germany and you can see the tell-tale signs of the owner-built home. In England, the development is structured, uniform and compact. In Germany, it's much looser, the gardens are bigger and the layouts seems more organic. The houses themselves are also much more individuated, although they don't appear from the sky to be anything too risqué in design. Don't think for a moment that 60% selfbuild equates to lots of radical architecture. It doesn't. The question is why have two seemingly quite similar countries developed such different private housebuilding models? It's something I discussed at length with Markus Kuhn last week. Markus is a leading light in the Cambridge University Selfbuild group and would love to build a home for his young family here, just as his parents and sister have each done back home in Germany. Markus has been researching some of the background of the German planning system and we have been comparing notes. One of the key differences to emerge is Germany's local residence models which are used to ensure the availability of building plots for locals and to protect the market from speculators. There were originally two such schemes, the Weilheimer-Modell and Traunsteiner-Modell, which have been widely copied and have in time been adopted in national planning law. In both, the outline planning permission process is started only after the land owner has signed contracts with the municipality or council. The municipality places conditions on any future sales which controls not only the price but also the qualifications of the purchaser. Locals are given precedence, although how local is defined is something I haven't been able to fathom. Ireland also operates a planning system favouring locals, sometimes referred to as Grandfather Rights. Dubliners fancying a spot of rural selfbuild have only to find out where their grandparents came from and planning permission is likely to be forthcoming in that parish. Things couldn't be more different in the UK, especially in England. Here it would be regarded as politically very dubious if one group of buyers were given preference over another simply on grounds of where they came from. We practice open access and and anything suggesting discrimination is viewed as being suspect. Indeed, we tend to pride ourselves on our liberal attitudes in this respect and we are secretly dismissive of countries which formally espouse liberal values but don't actually practise them at grass roots level. What we do do in the UK is make concessions for affordable housing. It seems quite acceptable to bring forward schemes for affordable homes for local people who would otherwise be shut out of their villages' housing markets, but this breaks down when applied to market housing where it has to be free to all comers. As housing has become more and more expensive in the UK, the definition of affordable housing seems to grow so that it now includes key workers and even young people generally who would never be able to afford a market-priced house. Thus gradually our planning system is adopting a more discriminatory approach, but its still a long way short of what happens elsewhere. One of Markus's interesting observations is that the home he currently lives in, which is in a 1930s suburb of Cambridge, seems to have been developed using a framework very similar to what happens in Germany today. The council appeared to have laid out the street, individual plots were sold to individuals and here and there small terraces or semis were developed by local builders for resale. Now, if that land was made available in Britain today, it would already be optioned off to a major housebuilder to do with as they please. This sort of speculative development rarely happens in Germany or indeed anywhere else in Europe. It's the key difference in our housing markets and it's the key factor behind that bar chart. What's exceptional about our housing market isn't that there is so little selfbuild, but that there is so much speculative development. But can the reason for this be placed on our open access planning regime? Have we cooked up a system that not only gives us pokey homes with little or no garden but also makes us mostly very anti-development. This in turn makes release of land for housebuilding very contentious, which results in very expensive building land which, in turn, means even pokier homes with even smaller gardens? Have we, in other words, created a monster of a vicious circle which protects the countryside but does very little for our new housing stock or the people that aspire to live in it? The paradox is that whilst I have been referring to our planning system as being open access (in that it's non-discriminatory), what has happened over the past fifty years is that it's become a closed shop in which you need to be a big player to get a seat at the table. The same process which has led to the destruction of our high streets, by enabling out-of-town shopping centres and supermarkets to dominate, has also led to our new housing market becoming dominated by a few mega-housebuilders answerable only to their shareholders, the complete opposite of what the Town & Country Planning Act sought to achieve in 1947. We could have done it differently. We could have kept speculation out of the new homes market. And we could have done it without a locals first policy, simply by insisting on owner-built homes, or some variation of the German-style policies. We would have lost more countryside, but we would have gained bigger gardens. And we might have built more houses overall and enjoyed lower house prices. We could yet change course and encourage selfbuild, but it would have to be at the expense of the major housebuilders and that's a message which I don't think the government, for all its genuine enthusiasm for selfbuild, has really taken on board. We can have lots of selfbuild, like Germany, or lots of spec. build, as we do now, but we can't have both. Planning policies either have to discriminate in favour of the little guys (be they local or not), or they leave a vacuum to be filled by big money. Our self build experience was that planning is centred around the concept that resources are very limited, and that uncontrolled building is without exception, a 'bad thing'. The result is that houses are built down to a minimum size (the 'least offensive' option) and that deviation from the norm is impossible to justify - particularly if you're a lone self builder. The next generation of houses are cowed versions of the previous generation. I'd favour a system where building is encouraged, but limited by handing permission to builders (big or small) in order of merit of the proposed home (I know, a vague term). So, a council might commit to expanding a parish by ten homes over the next year and then choose the best from all submissions in the parish - regardless of their provenance. In short we need to bake in the idea that a well built, well designed home that meets local needs is preferable to one that meets regulations and offends the least. The current system is all about preventing you from building a bad house rather than encouraging you to build a good house. Regardless of your criteria of 'good' and 'bad', the former encourages people to build down to the limit rather than reach for the best. The other obsession is one of 'consistency', when there has been no proven benefit from our planning system over the last century. Centralised planning criteria prevents local outbreaks of charm, originality, experimentation and creativity. The justification is that without it we might 'run amock' - but when building regulations ensure basically sound houses, is there any evidence that relaxing control would seriously damage our local street scenes? Examining the logical extremes of such control - do fully planned conurbations feel natural, organic or special? German planning law (BauGB §123) states that it is the job of the local government (council) to build the required access roads and bring in the services (gas, water, ...) when its planners open up land for development. I don't see such a thing happening in England. As a result, building plots that come on the market in Germany are almost always serviced (or will be by the time construction can start), whereas building land on the UK market is mostly unserviced. In Germany, speculative developers and self-builders will equally bid for serviced plots, and self-builders are often winning the bidding process for suburban and rural land that has lower-density planning permission, whereas speculative developers tend to focus on urban sites where higher densities are allowed (apartment blocks). In the UK, on the other hand, local government does not seem to be required or interested in creating serviced plots, and so all plots on the market are unserviced. Unserviced land is rarely attractive for self-builders, who just want to build a single home, rather than an entire road network. The crucial difference is that in the UK, government planners are only reactive: they only consider outline planning permissions proposed to them. In Germany, they actually plan entire sites before they come to the market. I suspect that self-building in the UK could easily be kick-started by requiring local councils to plan the layout of any new land that they release for development, and then build the roads. The council's site plan would have to define the location of roads and plots, and specify for each basic permitted building parameters: maximum footprint/floor area/height, roof type/pitch, building lines, usage, etc. The cost for building the road and bringing in the services can be recovered from the purchaser of the land in form of a service fee (say ~20k£) that is payable before final detailed building approval is granted. This model might actually increase profits for UK land owners: there will now potentially be more competition from more bidders, not just the usual small club of speculative developers (who I'm being told also routinely bribe estate agents to intercept plots before they appear on the open market). Your additional comments complete the picture. The German municipalities act as enablers. In the UK, the planners just see themselves as fact checkers and box tickers, and increasingly tax collectors, leaving the market to decide what happens next. And the markets follow the path of least resistance, which is towards mega-deals on large land releases. But unsurprisingly this proves to be unpopular with the community at large and this promotes strong NIMBY forces which agitate against development, partly because its being done for profit by large faceless concerns who will leave the neighbourhood as soon as they have completed their work. UK's free market approach results in fewer, smaller, less popular homes than Germany's managed early intervention. Mark post Mark, perhap lack of funds, building permission and suitably locations maybe the reason to so little self builds. I suspect the main reason would be lack of funds. For the majority of self builders the planning system must be the major hurdle and the one that kills too many projects. The time it takes and the costs involved in securing a planning permission can be onerous. The final nail in the coffin can be costs associated with legal obligations and the newly introduced Community Infrastructure Levy. I have heard of schemes in Rutland where the CIL on a single dwelling is something like £25k, those schemes haven't gone ahead. In the UK planning system there is simply way too many planning and environmental regulations, policies and rules to follow and comply with. This suits the major house builders as they have the time and resources to follow the planning system and are of a financial standing such that they can stand the odd permission being refused. This is too big a risk for the self builder. It does seem absolutely crazy that it can take 2+ years to secure planning permission for a house. If a former life I was Property Director for a major aggregates company are we worked on the basis of starting the planning process 6/7 years before we needed the mineral. You need the perseverance and patience of a saint. It is fundamentally wrong when in working up your application you basically have to submit a a plan and then be told what is wrong with it and start again, repeat and revise, compromise and over time arrive at a scheme which is accepted. In short a compromise. It is worth looking at the town of Almere in Holland. A new town which is thriving, lots of self builds. Apparently to town major was criticised for the time taken to secure planning consent for a house (it took a number of weeks) and he sorted it out with his planning department. It can now take less than a week!! Somehow we have to rid ourselves of a significant amount of planning and environmental legislation, the whole process is way to complicated. Whilst permissions have been granted what have we been left with. I bet in another 20 years time housing estates built in the 90's and 00's won't be where people want to live. However I bet there will be thousands and self build homes that will stand the test of time and will be the type of properties that people want to live in. On the point of local authorities providing serviced plots this isn't going to happen in the UK. However I am convinced it will happen via the private sector. I was involved with a project recently where we did consider it. The site however was too big at 60 plots (normal volume layout) which would have stood about 35 self build plots. The infrastructure costs on this particular scheme were too high. I would still like to find a suitable site. Yes profits would be lower than selling to a major house builder but I believe you would leave a legacy and not just another housing estate. A very interesting article, I had no idea that we are so far behind the continent on the self build front, is it because we have more rules and regulations? Really intetesting article - also interesting discussion in comments. Great to see both proposition, and revealing of nuts and bolts that contribute to successes and failures. Im beginning an AHRC funded research project called Motivating Collective Custom Build where we aim to reveal tangible ways in to selfbuild in the UK for those interested yet unable currently to engage. If anyone is interested in talking to us, please get in touch by email via sam.brown@sheffield.ac.uk . We are London (myself and David Birkbeck at Design For Homes) and Sheffield (prof. Fionn Stevenson and Dr Cristina Cerulli) based and more than happy to chat around the topic. FAr too much red tape in the UK and the price of building land through the roof. We have been subjected to blatant corruption by our Councillors one of whom lives opposite which has resulted in a long expensive and community destroying journey through the planning system. We started off with an architect designed proposal which attracted the interest of the Grand Designs programme but 7 years later we stand now at appeal with a good quality but bland developer style proposal and have not only wasted a lot of money and frankly even more time and effort but are now subject to these imposed taxes originally supposed to be aimed at the big developers. Really interesting article. As someone who wants to build their own home one day, I am very daunted about finding a piece of land for a reasonable price.